Duncan Stewart will have a familiar face caddying for him when he teams up with Russell Knox in this week’s ISPS Handa World Cup of Golf in Australia. On his bag for the event at Kingston Heath in Melbourne is Keir McNicoll, who was once Scotland’s lowest amateur off plus five and is now a PGA pro at Gullane. “Duncan is one my best friends in golf and it just so happens that he needed a caddie for the tournament this week and I was more than happy to dust off my caddie’s bib and oblige,” said McNicoll, who plays on the Tartan Tour. Knox and Stewart began their preparations for the event by playing 11 holes yesterday, with Stewart having broken up his journey by spending a couple of days in Dubai last week. “The boys decided it was best just to play 11 holes today as this would give them a feel for the greens and how some of the holes set up,” added McNicoll. “With the wind direction unusually coming from the north, the course was playing very different to how it will play compared to the prevailing southerly breeze that is due for the rest of the week. “Despite this, both players got some good early work in that will hopefully prove vital as we progress through the week. “After seeing the course for the first time, I would say there are a lot of really good par 4’s and 5’s but the par 3 15th is one of the best holes out there so keep an eye out for that one on the TV come Thursday. Scott Henry will make his European Tour return in next week’s Alfred Dunhill Championship in South Africa. Henry, who secured his place back at the top table in European golf by finishing joint-second in last week’s Qualifying School in Spain, is being joined at Leopard Creek by David Drysdale and Scott Jamieson. Canadian Mackenzie Hughes became the first PGA Tour rookie in 20 years to go wire-to-wire as he won the delayed RSM Classic in Georgia. The 25-year-old holed an 18-foot par putt to win a play-off that had spilled over to Monday due to darkness. “I made the putt of my life right there,” said Hughes after coming out in the sudden-death shoot-out after Swede Henrik Norlander, Camilo Villegas and Blayne Barber had all missed their par putts. American Paige Spiranac is returning to compete in the Omega Dubai Ladies Masters at the Emirates Golf Club next month. The 23-year-old made her first major pro debut at last year’s event. 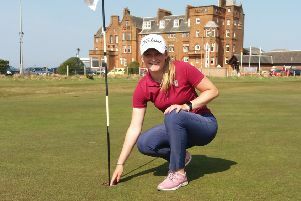 She made the cut in the Aberdeen Asset Management Ladies Scottish Open earlier this year and has since captured her first professional victory on the Cactus Tour. Edinburgh will stage the Scottish Golf Awards for the third year in a row when the glitzy bash return to the city’s Corn Exchange on 24 February. Organised by Scottish Golf, the ceremony will be hosted by broadcasting duo Dougie Vipond and Alison Walker. Beatson Charity Centre is the event’s new charity partner and 1999 Open champion Paul Lawrie will be there to present the Adam Hunter Award. Crail is staging an event on the 2017 Mid Amateur Golf Tour and it will carry World Amateur Golf Ranking points. The Scottish Mid Amateur Championship, to be played on Craighead Links on 5-7 October, will be the penultimate one on schedule comprising of more than 30 events.